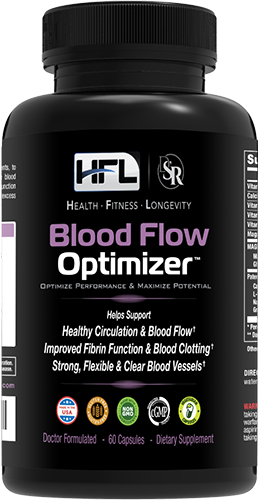 This page will discuss a variety of ways one can best utilize Blood Flow Optimizer™ for maximum benefits and results. Please read the below "cycle" information, as we have designed a few to suit your specific needs. If you're a first time user of Blood Flow Optimizer™, it is best advised that like any new supplement, you first start off at a very low dose the first 2-3 days, simply to see how your body reacts. As a dietary supplement, take 2 pills daily with 1 glass of water with a meal (before, during or after). Ideally, it would be best to take 1 capsule, 2x daily - thus, spread it throughout the day, rather than all at once. But, if you tend to forget, then you may take 2 pills at once, every day. An alternative way to take it is 3 pills daily (preferably spread throughout the day), but taking the weekends OFF. It works out the same. 3 pills daily - preferably 1 pill, 3x daily. 4 pills daily (2 pills, 2x daily), but taking the weekends OFF. Always taking it with 1 glass of water with a meal (before, during or after). I'm currently on a "blood thinning" drug and I want to stop using it, how? Many people who contact us want to go the "natural" way and not use drugs because of the numerous negative side-effects. So, Blood Flow Optimizer™ is a great solution. However, some people are currently taking a "blood thinning" (anticoagulant) drug such as Aspirin, Plavix, Warfarin/Coumadin, etc... and want to STOP using it, because they would rather use something natural and they are tired of the negative effects. Over the years we've had hundreds and thousands of people report back to us the success they've had by using Blood Flow Optimizer™ instead of their prescription drug or in addition to, while lowering the dosage of their drug. Either way, the end result is less drugs and negative side-effects. Start using Blood Flow Optimizer™ slowly. A this point, you can being taking the general recommended dosages. For example, if you are taking 75 mgs of Plavix daily for 10 years (which is an average dose and long duration), then you'll need to take a 3-6 months to SLOWLY lower the the dose. Versus if you've been on half the dose for only 3 months... which is a lower dose and you can probably just get off quicker. So, it's very difficult to give specific advice here. Needless to say, slowly lower the dosage over the next few weeks, but don't get off completely. Lower the dose to about HALF and then do another blood test in 3-6 months. If your numbers are good, then take another 1-2 months and cycle OFF the drug. One reason you don't want to just get off a drug completely or quickly is because these drugs are "addictive" to the body and will cause a negative "rebound" effect and can cause circulatory problems. Using Blood Flow Optimizer™ will help, but it can only do so much. That's why we've emphasized "slowly". What other users have reported back to us is that they slowly add in Blood Flow Optimizer™ during the first 2-4 week time span and then slowly lowered the dosage of their prescription drugs, but did NOT get off completely. Do a blood test in 3-6 months and if the numbers are good, then you can consider getting off the drugs completely. Once again, you should always FIRST consult with your doctor when making any changes to your current medications. I'm currently taking Aspirin, do I still need to use it? We legally and ethically can't tell you to get off any drug, even if Aspirin is over-the-counter, it is still a DRUG and has negative drug side-effects. But most people have reported back to us that Blood Flow Optimizer™ does a great job of replacing the benefits of Aspirin, but without any of the negative side-effects.